Lately Mike and I have been switching off planning our weekly dates. It was my turn this week. My friend Christina told me about the Paradise Valley Orchards, so seeing as Claire was joining us this week (like most other weeks), I thought it would be fun. It was a very cute place. Any pumpkin, any size is only $2.00. 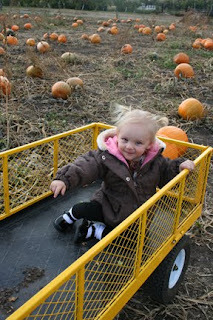 Claire loved that they gave you a wagon to go get your pumpkins. 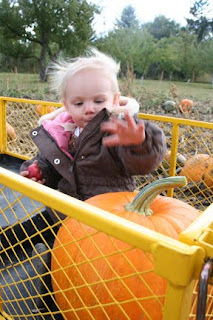 I think what Claire loved the very most was the small apple she found in the wagon. 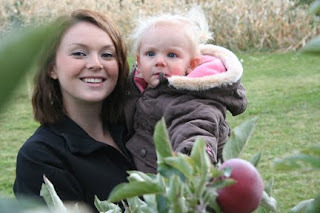 She wouldn't hold still to take the next picture because she wanted to pick all the apples. I think next year we will have to go back and do the U-pick apples. We decided that we will have to bring Grandma Jane to pick her McIntosh apples next year. 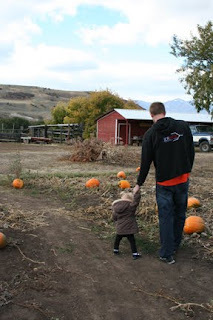 Claire loved walking around with her daddy looking at all the pumpkins. 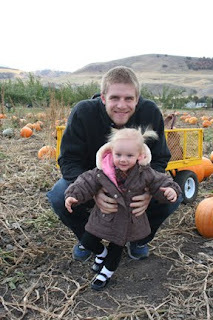 Note Claire's new hairdo, the pigtails, while posing with her handsome dah-ee (daddy). We decided that her "fountain" aka the top of the head ponytail was no longer working. It was about 3 inches tall and stuck straight up. 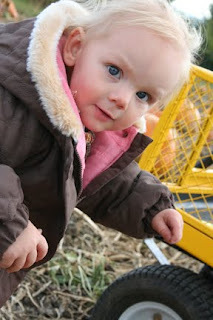 We had lots of fun at the pumpkin patch, even though it was a bit cold (note Claire's new winter coat). We will definitely return next year! 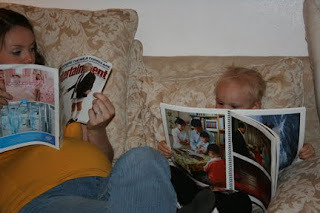 When we got back Claire and I decided to warm back up on the couch while doing some light reading. 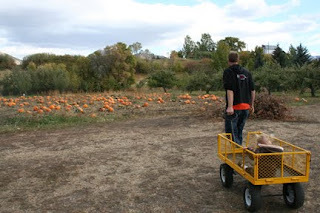 Maybe next year Claire will be able to pull me around in the cart.